Viva Mexico! I am back to my regular day to day activities by now, but I'm pretty sure my mind is still on the beach somewhere. Today I am linking up with Erika to share my favorite things from this past week, but I am focusing solely on my trip to Playa del Carmen in Mexico. We stayed at Mayakoba and it was a stunning resort with great service and great food. The spa and massage were incredible as well. No complaints here! I'll catch up on other favorites from this week in next Friday's post perhaps. Mexico sunrises on the Caribbean coast are nothing short of spectacular. I make no bones about how much I love a good sunrise when (if) I run outside in Houston, and I make an exerted effort to catch them when I'm traveling in other places. There's just something so powerful about the sunrise and feeling connected to the Lord. I like to go for a run, but some mornings I may just stand with my feet in the water with worship music on praying and pontificating life and pent up emotions. Its the real deal. I may or may not shed a tear or two as well. I missed out on the first morning's sunrise from sleeping in - major remorse followed. Nonetheless, here's some of my favorites from the rest of the mornings. It's amazing how every few minutes the sky can look totally different. And please recognize that these are unedited photos! 2/20/17 picture one turned into picture two - say what??? Those colors! The only sunset I saw was this one on 2/20/17. I was typically getting ready for dinner during sunset and I unknowingly missed out! These Mossimo - Irene Ghille Lace Up Pumps, because GET OUT!! Are they not stinking cute?!?!?! ?1 I bought both black and red (guilty as charged). I didn't want to do it. I had to do it. I don't even know how often I will be able to wear them, and wasn't sure if I would keep them. But, I took the red ones on my trip and it's settled. I'm in love. Action shot! I was telling people it was OK to walk past my very informal photo shoot. Side note * I took a LOT of pictures with these cat statues as you'll continue to see. There was so much open space next to them that I couldn't help but find myself sitting next to them. My Boca Leche dresses received quite a few compliments so I thought I'd share this cute site I purchase from periodically, but typically only when they have a sale. I actually ordered the dress below from Boca Leche as well, but it's no longer listed on their site. I'm showing it so that you know the variation of things they offer. I paired it with my Mossimo Pamela ankle strap heels in black. Why do I look sad as if someone just said I couldn't have more guacamole? National Margarita Day was Wednesday, February 22nd. Now, for the record I didn't actually have anything alcoholic to drink on Wednesday, much less a margarita. However, had I not just spent the previous five days imbibing adult libations including but not limited to margaritas then perhaps I would have partaken in the "National Holiday" that should have fallen on my birthday in November. Who's responsible for picking these "National ~ Whatever" dates anyway? I had a little too much fun with my "Bye Felicia" Bath and Body Works hand sanitizer, but have decided only to post a couple of the pics. My number five has to go out to the ridiculousness that ensued a majority of the time. 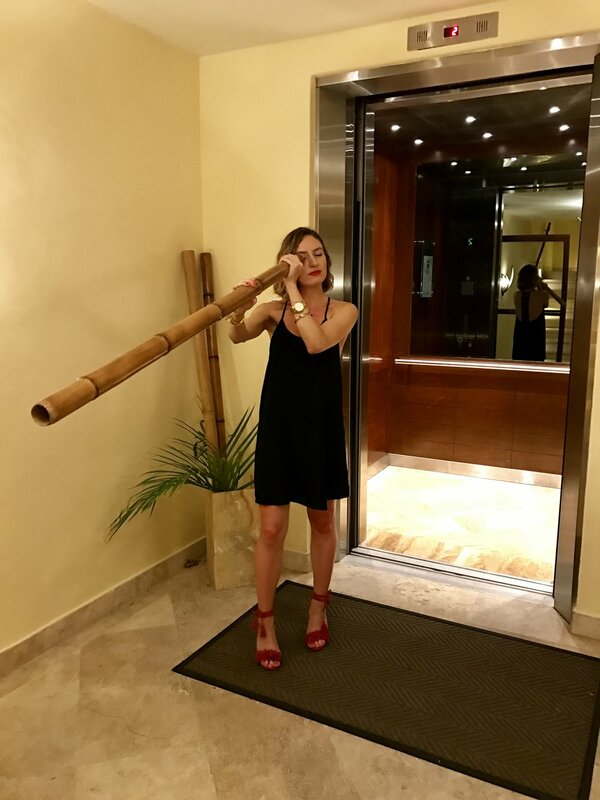 Between opportunities to make Bitmoji replicas, practice my "Salt Bae" moves, or mimic the funny signs around the resort, yours truly did not hold back from making myself look like a fool. We sure did laugh a lot though and that's what matters. Well that sums up my trip for the most part in my Friday Favorites. How did you spend your long weekend? Go anywhere fun? Whatever you did, I hope it was a great time but even more so I hope this weekend is even better for you! I'm looking forward to mine without a doubt. Please make sure to subscribe below to receive new blog posts. I'll review Mayakoba on TripAdvisor soon, but in the mean time you can always peruse previous reviews I've submitted.